Taramasalata, at its most basic, is a Greek spread made from salted fish roe, intended to be eaten with loads of fresh pita bread (ideally on a sun-drenched beach somewhere on a Greek island, but I digress). To me, it is the meze of all meze, far exceeding all the hummus and tzatziki I grew up eating in Vancouver. Honestly, I am not sure how I managed to overlook this fantastic spread until I moved to Paris, but now that I have discovered it, and especially since I now know how to make it myself, I am hooked. A couple of notes to get you started: Taramasalata is emulsified almost as if making a mayonnaise. Extra virgin olive oil is the traditional choice in Greece, but I find that a more neutral oil, such as the sunflower seed oil used in this version, lets the saltiness of the fish eggs really sing. Potatoes, white sandwich bread (with the crusts removed), stale bread crumbs and even almonds are used to help thicken the mixture, however, I am most fond of white sandwich bread for this recipe. No salt is added, but lemon juice, and even a bit of vinegar, are included for seasoning. A little grated yellow onion, or a small clove of microplaned garlic can also be incorporated, but I choose to leave them out. If you have trouble finding smoked cod roe, substitute any other small fresh, salted fish eggs. In this case, you’ll need to use a blender to emulsify the spread instead of a mixer. Finally, the flatbread: the richness of the buckwheat and potato go so deliciously well with the slightly salty, tangyness of the taramasalata. Together, they make an excellent Greek island-inspired late-afternoon snack, perfectly accompanied by a nicely chilled glass of natural white wine. Bring the potatoes to a boil in well-salted water and cook for 25 minutes, or until soft and easily pierced all the way through with a fork. Strain and allow to cool completely. Roughly mash the cooled potatoes. Preheat the barbecue to 400 F.
Prepare a bowl of flour in order to coat each piece of bread (and your hands) for easier shaping and to avoid the bread sticking to the grill. Scoop six individual portions of the dough, one at a time, into the flour. Coat generously before roughly shaping each scoop into a 1.5-cm thick flatbread. Shake off any excess flour before placing on a well-floured cookie sheet in preparation for grilling. Lay each bread on to the hot barbecue, pressing gently into the grill in order to create ridges. Close the barbecue and allow to grill for 3-5 minutes, peeking at the breads periodically to ensure that they are grilling nicely, but not getting burnt. Using tongs, gently loosen each flatbread before flipping over, again pressing down gently into the grill and continuing to cook for 3-5 more minutes on the second side. Each flatbread should be nicely grilled on the outside, but still soft and fluffy on the inside. Depending on the strength of your barbecue, you may even be able to get nice dark grill marks. If you aren’t feeling confident, test cook one bread before proceeding with the rest of them. Serve immediately as these breads are best enjoyed straight from the barbecue. Dip and soak the crustless white bread into a small bowl of cold water. Gently squeeze out any excess water before placing into the bowl of a mixer. Each slice should still be nice and moist, but definitely not soaking wet. Scoop the fish roe out of its skin and add to the bowl. 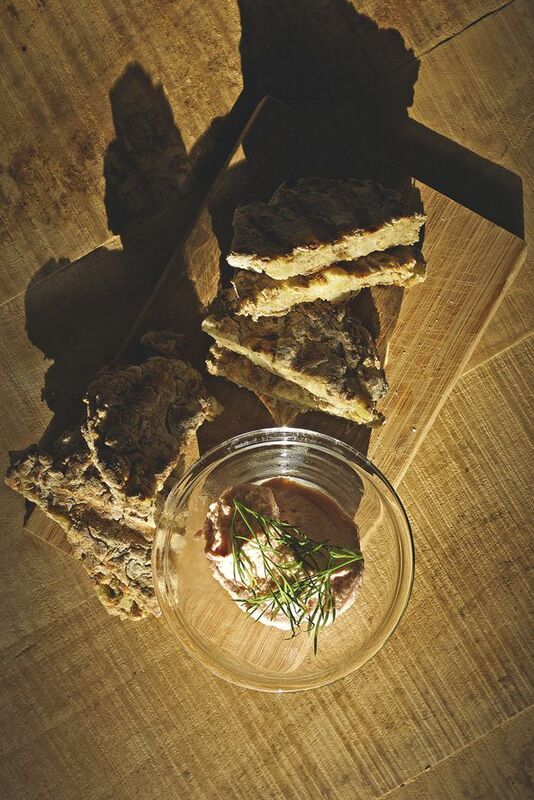 Using the paddle attachment, whip the bread and roe on medium-high until a smooth paste is formed. Continue to whip on medium-high, slowly adding the oil until fully emulsified. From my experience, the more time you take to drizzle in and emulsify the oil, the better the resulting emulsion. Note: If you are using fresh roe and therefore a blender, blend the bread and roe together into a smooth paste before slowly emulsifying in the oil. Use a spatula to periodically scrape down the resulting paste from the sides as it will get quite thick. To season, add the lemon juice and rice vinegar at the end and allow to whip for 10 more seconds to combine. Garnish with fresh dill and serve immediately or, if you prefer, store in the fridge in an airtight container for up to 2 days until ready to serve – that is, if you can wait that long.